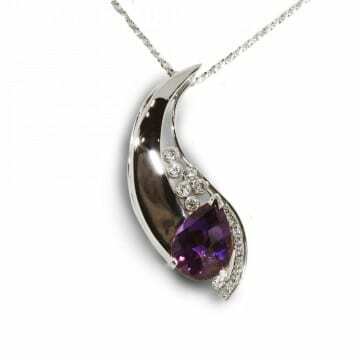 The 14kt white gold pendant features (1) pear shaped amethyst (4.46ct.) accented by (15) round brilliant cut diamonds (0.42ctw.) Chain sold separately. 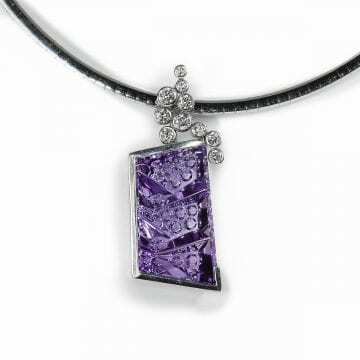 The 14kt white gold pendant features (1) amethyst (15.45ct.) cut by lapidary artist John Dyer. The amethyst is accented by (10) round brilliant cut diamonds that have a carat weight of 0.52ctw. Designed & fabricated by Paul Richter. 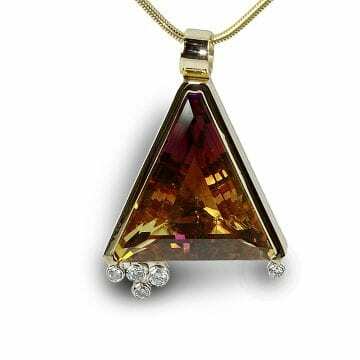 The 14kt yellow gold ametrine and diamond pendant features (1) triangular step cut ametrine that has a carat weight of 34.38ct. 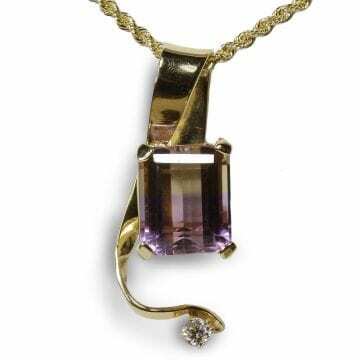 The ametrine is accented by (5) round brilliant cut, bezel set diamonds that have a carat weight of 0.27ctw. Chain sold separately. 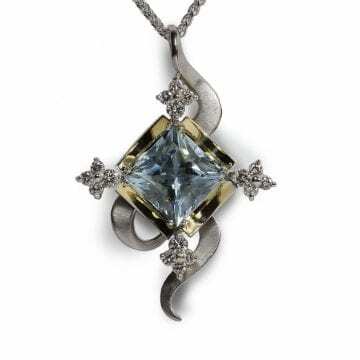 The 14kt yellow gold pendant features (1) emerald cut ametrine (7.0ct.) accented by (1) round brilliant diamond (0.12ct.) Chain sold separately. 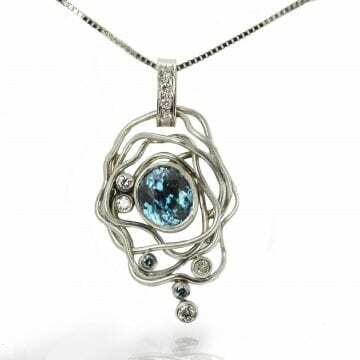 The 14kt white gold pendant features (1) bezel set with oval cut aquamarine (1.11ct.) accented by (2) round brilliant cut diamonds (0.05ctw.) Chain sold separately. 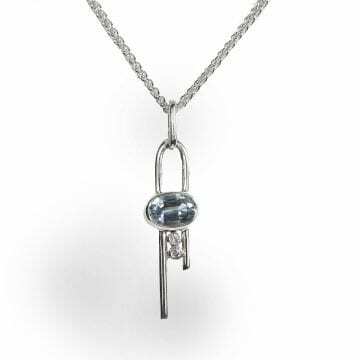 The 18kt white & yellow gold pendant features (1) princess cut aquamarine (10.19ct) accented by (16) round brilliant cut diamonds. Chain sold separately. 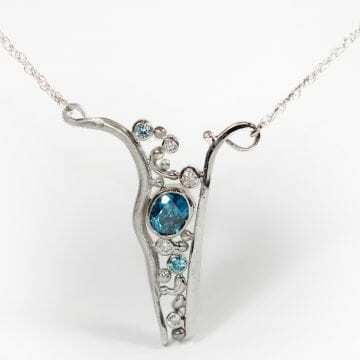 The 14kt white gold aquamarine pendant features (1) trapezoid cut aquamarine (13.84ct.) that was cut by lapidary artist John Dyer. 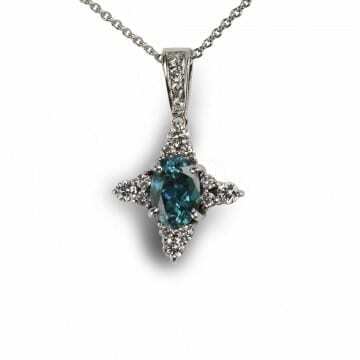 The aqua is accented by (7) round brilliant cut diamonds (0.28ctw) and (4) round brilliant cut aquamarine (0.16ctw.) Chain sold separately. 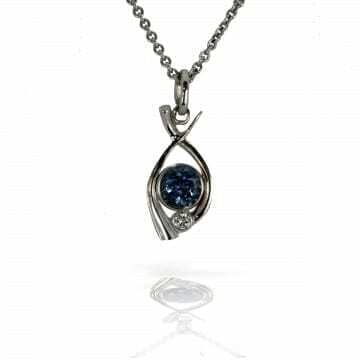 The 14kt white gold pendant features one center oval zircon (4.36ct) surrounded by 0.81ctw of diamonds. Chain sold separately. The 14kt white gold blue zircon floating necklace features (1) oval, bezel set blue zircon that has a carat weight of 2.73ct. The zircon is accented by a round brilliant diamond (0.04ct.) 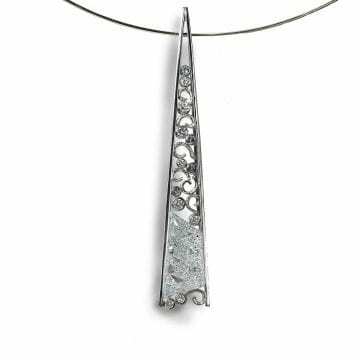 and hangs on a 20" 14kt white gold rolo chain.